Pieces by Polly: FreeCycle Find of the Century: My New Sewing "Room" - Repurposed "Entertainment Shelf"
FreeCycle Find of the Century: My New Sewing "Room" - Repurposed "Entertainment Shelf"
Update as of 3/24/2011: I decided on a whim to link this up to Tatertots and Jello's creative space linky. I really should take some new pictures since this is back from when I started blogging and the pics really aren't very good or well cropped. I hope you'll enjoy the ideas though if you live in a cramped space and check out some of my more recent ideas. Thanks! I like Freecycle. It has it's good and bad points as very humorously pointed out here by Julie at Joy's Hope. Go read it and come back. She is hilarious! This is seriously the nicest piece of furniture in our house now. The vast majority of our furniture is made out of laminated particle board...and this is real. This is NOT getting turned into a kid kitchen. It's also not for our TV because our TV would look ridiculously tiny in it. 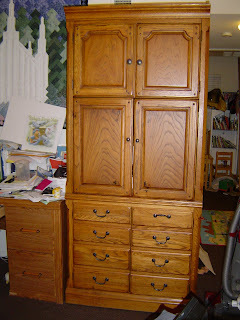 Instead...drum roll please...it's my new sewing "room." 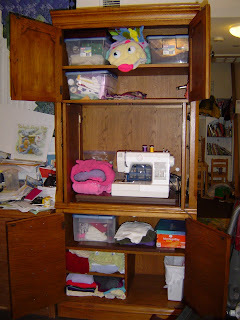 Now I have a way to have my craft stuff where I can get to it when the kids are napping and be able to close the cupboards to keep them out of it when they're awake. There are a few things I will probably to with it to make it a nicer, more personalized workspace, but when we have three kids in a tiny two bedroom apartment, this is such a blessing and just in time to get an early start to Christmas projects. Firecracker and I did our first project with the new set-up...and I'm still excited!! Love the blog! Thanks for giving me credit for the initial burp cloth idea - that was a fun project 7+ years ago! Great writing, fun pictures, and best of all...GOOD IDEAS! Way to go!